The Camp Nou said goodbye to Javier Mascherano during the quarter-final between Barça and Espanyol. ‘El Jefecito' was thanked for his hard work and dedication over the last seven and a half years, during which he won 18 titles and played 334 matches defending the FC Barcelona shirt. Mascherano stepped out onto the pitch with his three children, his team mates forming a guard of honour to mark the occasion. The message ‘Thank you, Masche’ was also visible in the centre circle in giant letters as the fans paid their tribute with a loud ovation for the Argentine. 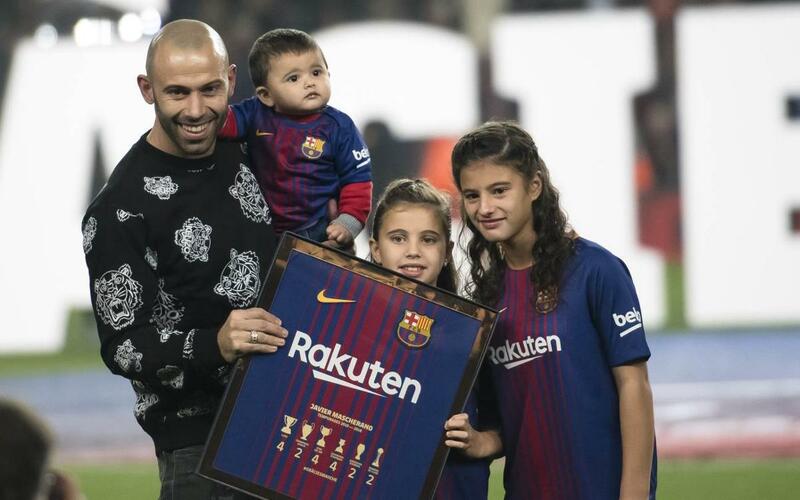 Barça captain, Andrés Iniesta presented the departing Mascherano with a commemorative framed image of the 18 trophies claimed by the Argentine in his time as a blaugrana. All this happened after the Club had held a farewell ceremony for the player on Wednesday, attended by President Josep Maria Bartomeu and several members of the Board of Directors, as well as the players and the coaching staff of the first team which took place in the 1899 Auditorium at Camp Nou.